Carnival Games VR Review | Nerd Much? As you may already know from my previous article about the PSVR, I am really enjoying my shiny new virtual reality headset. I have stacked virtual blocks to unimaginable heights, played golf with 100ft robots, defused bombs with my fiancée, hung out in virtual bars, and, of course, donned the cape and cowl. So, this is all to say that I’ve had a pretty nice mixture of VR experiences, from narrative-based adventures to fun high score showdowns. They’ve all been pretty enjoyable, but nothing has really captured the pure childlike delight that virtual reality can create like Carnival Games VR. This game is just pure fun. But the question is: is that enough? For some reason, I’ve been having a pretty hard time figuring out how best to rate and review this game. It feels like trying to review Wii Sports, something so intrinsic to the Wii console and its success that it feels odd to review it like a regular game. Carnival Games VR is a pretty shallow game, but, at the same time, it’s a lot of damn fun. I’ve been using that word “fun” a lot, because there’s really no other way to describe the game — and it’s also the game’s greatest strength. Sure, you can easily unlock every wing of the park and the dozen games contained within in about an hour, but it’s not like the games lose their appeal after that. Thankfully, an ever-present leaderboard and the ability to dive right back into a mini-game seconds after receiving your tickets keep most of the games from feeling stale. I found myself trying “just one more time” to best my high score at nearly every carnival booth. There were some exceptions, though, like the Climbing Wall which I enjoyed at first then got so frustrated with tracking issues and a little nauseous from repeatedly falling that I couldn’t bring myself to try it again. After I finished trying all of the mini-games again on my second day of having the game, I came up with what I think is the only way for me to accurately review this title. I am going to rank the mini-games from most to least fun then describe the strengths and weaknesses of each one. Before I do that, though, I just have to explain a little about how Carnival Games VR works. 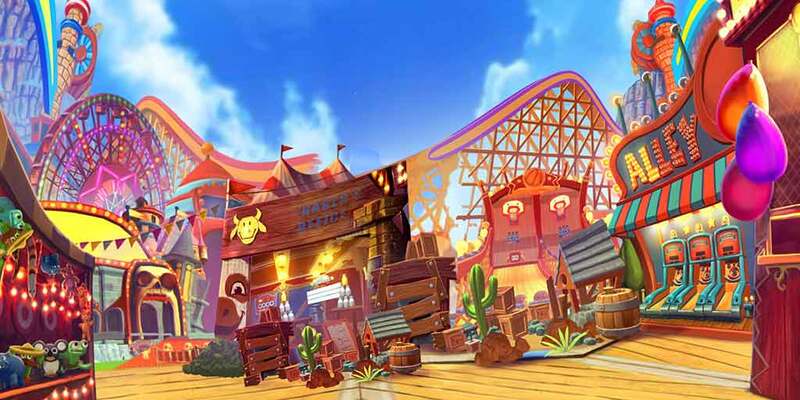 As soon as you boot up the game you are dropped into a theme park with four wings, taught how to re-center the screen, and then you’re instructed to enter “Cowpoke Corral.” Then you are told to play a game called Golden Arm, after which you learn that each game awards 1-3 stars and 5, 10, or 25 tickets respectively. Tickets are used to buy prizes in the form of digital stuffed animals. Most prizes have no real purpose other than to serve as trophies that double as “toys” you can “play with” (by that I mean throw on trampolines and watch them bounce) in the Playroom. The prizes that do matter are the ones that you need to unlock need new games and theme park wings. So, you play games vying for the high score on the global leaderboards, earning tickets until you unlock all twelve games. It’s pretty straightforward and the only thing I think Carnival Games VR is lacking is true multiplayer and social components. Other than that, I don’t really know what else you could add to a game like this, besides more mini-games. That sums up everything you need to know about the over-arching Carnival Games VR. The only thing left is the previously promised mini-game ranking and descriptions. Shooting Gallery, Cowpoke Corral — this is just like it sounds; you shoot targets. There are other VR games out right now that are similar to this, like the London Heist shooting gallery demo, but somehow this seemed more fun. I think it has something to do with the fact that the guns shoot projectiles in the form of plastic balls rather than taking a hit scan approach. You have to compensate for how the “bullet” will travel and lead your target. Also, you get to dual-wield, making you feel like a real cartoon cowboy! Golden Arm, Cowpoke Corral — a carnival classic, minus the rigging. This game has you throwing baseballs at stacked milk jugs. You have to knock over the gold jug to make it to the next round, and you get bonus multipliers for every ball left over, but the round ends as soon the last gold jug falls. You also get points for every silver jug, which creates a surprising strategic element: do you try to end the round as fast as possible or hit as many jugs as you can? Funnel Cake Stacker, Gizmo Grove — I put this third because it has very different mechanics from another other game. Most games have you throwing things at or into other things in a variety of ways, while this game has you catching things. About forty funnel cakes get shot out at you and you have to use a different plate in each hand to catch and balance as many as you can until the end of the game. It gets very intense when the last ten shoot out in rapid fire and you have to frantically balance everything without losing your whole stack. Swish, Sports Station — I love to play basketball in real life so, naturally, I enjoy this game. In fact, basketball games are my favorite in any arcade and I often spend a lot of time (and money) on them. This would be my favorite game, if it didn’t feel so unnatural. Something about the physics and shooting mechanic just doesn’t feel right. It’s still fun, just doesn’t feel like basketball (for reference, the Wii Sports three-point shootout feels better to me). Fast Pitch, Sports Station — this is probably the hardest game, at least for me. You have to pick up a baseball glove and catch unpredictable pitches that escalate in difficulty and speed. Unlike baseball, you get six strikes until you’re out, but that doesn’t make it any easier. Everything feels pretty good here, I just didn’t have too much fun with it — not sure why. Alley Ball, Cowpoke Corral — skee ball. Everybody knows and loves skee ball. Is it as fun in VR as the arcade? Not really. Actually physically holding the ball and feeling it’s weight actually helps a lot in this classic game. One thing I will say about this is it feels better than Sports Bar VR‘s “skree ball” and that’s not because of ball physics, because that game nailed everything about physics, especially in its billiards centerpiece, but it has something to do with the way the ramp behaves. Alley ball is just okay, and it’s not something I found myself coming back to after accumulating the required tickets to move on to the next area. Ring Toss & Pop Darts, Wizards Walkway — it’s actually a toss-up (see what I did there?) between this and pop darts. Both are decent enough, but not quite as fun as the others. I’m actually quite good at ring toss in this game which, believe it or not, makes it less entertaining. It just doesn’t haven that addicting quality that something like the shooting gallery has. What is a nice twist, though, is that as you get more points the game makes it harder by removing some of the pegs. And pop darts is on the exact opposite end of the spectrum for me; that is to say, it’s a bit too hard to be addicting. It is a little fun, and actually very satisfying when you hit the bullseye that pops all the balloons at once, but it just doesn’t do much for me. To compare this to Sports Bar VR again: the darts in that game feel amazing, and very real — in fact, I’m nearly exactly as good (which is not much) at VR darts as real darts, which probably means the developers did a great job. Climbing Wall, Wizards Walkway — okay, now this is completely different than everything else and probably could be at the top of the list… if I didn’t have so many issues. Believe it or not, the climbing feels pretty great. I really felt a sensation of upward momentum. I even smashed the move controllers into my ceiling light four times while climbing this beast of a wall! What ultimately made it failure, at least for me, were the tracking issues and other control problems. I fell so much that I started to get sick, because when you fall you do so fast and the scenery zips by at a naseousating pace. All of this makes this mini-game quite hard, and I found the 81 seconds requirement laughable when I finished at five minutes. I think the developers may have suspected this because they added a floating stop sign that allows you to quiteonce you reach a certain time limit (or fall rate, I’m not sure because I did so terribly). Down the Stretch, Sports Station — now these last three are when the game really takes a sharp downward turn. Down the stretch is that game where you roll small balls into a series of holes to advance a little horse. First to the end wins. This is fun in a real carnival setting for one big reason: competition. In the real world, carnival game runners don’t start the game until enough plays sit down… so, since you’re playing alone, it’s easy to see why this isn’t fun. It’s also too easy. Shark Tank & Haunted House, Gizmo Grove — both of these last two games are on the bottom because they’re rehashes of earlier games. Sure, they’re fun in their own right, but the other versions are better. Shark tank is essentially golden arm but you’re throwing at a shrinking target to dump random park patrons (played by NPC). The throwing mechanic is exactly the same so it still feels decent; however, it’s too hard to hit the target and just not as enjoyable. The haunted house seems like it should be more fun than the shooting gallery, but it’s just not. The problem is it’s a two minute long on-rails shooter — not unlike Until Dawn: Rush of Blood except way less scary — that never changes. It’s pretty cool the first time, but I didn’t find myself wanting to play again and again like I did with the shooting gallery. That covers all of the mini-games and, for the most part, the entirety of Carnival Games VR. There are also about a dozen trophies you can earn, if you’re into that. Lastly, each wing has a Playroom that lets you “play” with the things you spent your hard-earned tickets on. As I mentioned earlier, “play” just means being able to pick up, put down, and throw the toys at holes, tunnels, trampolines, and a moving train — that’s pretty much it. Overall, Carnival Games VR is good cartoonish fun worth the $20 admission. There’s enough replayability to warrant busting it out every time you have a VR-virgin over, but the lack of multiplayer or any real draw to bring you back after the first few hours makes it less appealing. Not including even a rudimentary social aspect a la Sports Bar VR seems like a missed opportunity. I just wish there was something more, and I’m still not sure what, that could compel me to routinely return to this theme park.